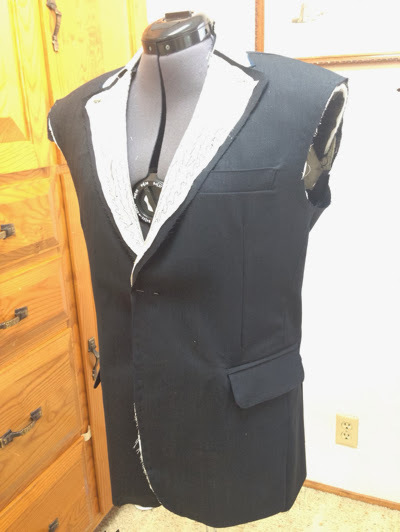 The suit is coming along nicely, although I spent a lot of fiddly time on one of the pockets. I don't think the method described in the Vogue instructions is the best, but I think it could be mastered with a bit of practice. 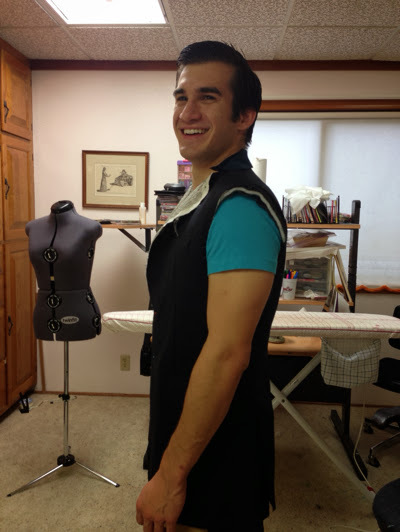 Here it is halfway done, trying it's best to hold itself up on my female dress form. And now the sleeves with their vents. These were pretty easy, with satisfyingly good results. 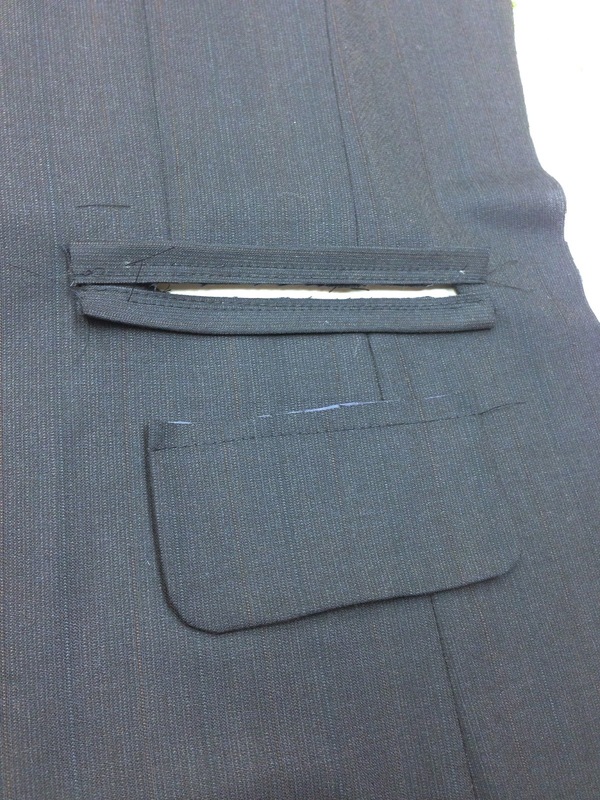 The buttonholes are not to be cut, with the buttons being sewn right onto them through the layers. 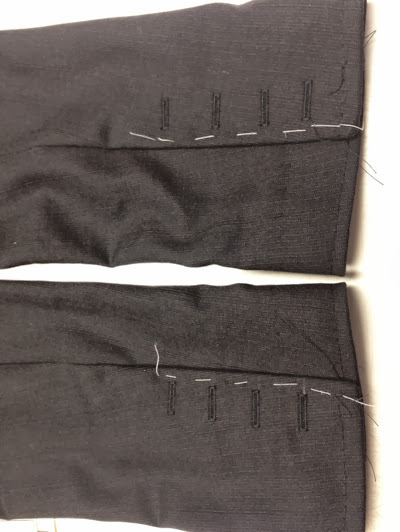 Personally, I think it would be easier to sew the buttons on with the vent open and just go ahead and use the buttonholes. But I suppose it looks neater not being cut. And some fun sewing room pictures. Here is one of the lower pockets, with its flap ready to be put in. The fabric is navy blue wool, much darker than this photo shows. The fluorescent light in my sewing room is just terrible for photos! I wasn't going to worry about matching the stripes, as they are barely noticeable, but well, there they are in the photo, and so I might have to redo those flaps. Guess I should have cut them out after preparing the pocket opening. I've done the cutting in two sessions this week. What a lot of pieces. Here are just some of them on my pingpong table, which has been my favorite place to cut lately. 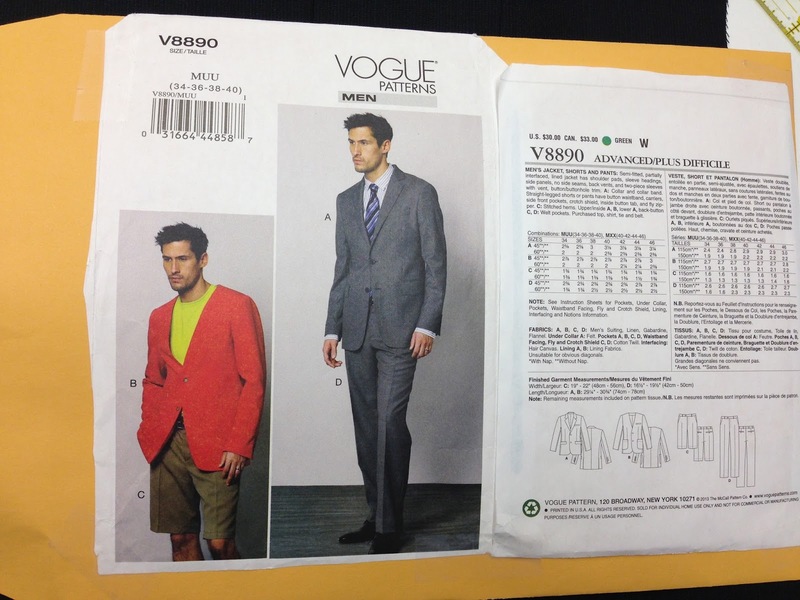 Here's the pattern, which I have to keep hidden else my husband bursts out laughing. A little package arrived today which was my backorder from WAWAK Sewing supply: a 6000 yd spool of cream jeans thread and bowtie hardware. 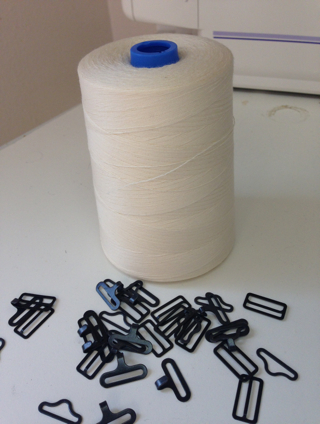 This is a whole a lot of thread! But I have been sewing a lot of jeans--three pairs and two pairs of jean shorts for my daughter this summer. And so I was wanting to add to my selection of top stitching thread colors. What about the bowtie hardware? Well, these were on sale and a couple years ago I was going crazy trying to find some of this hardware, which came in packages of two. I am so excited about how little time it takes to make this top, basically a T-shirt which can be worn just about anywhere. 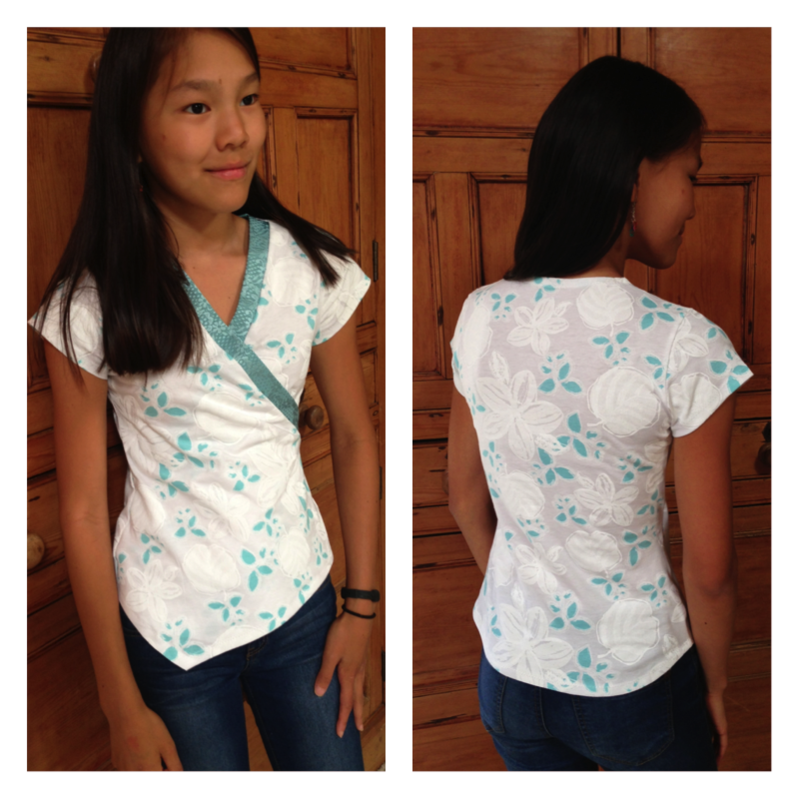 It is comfortable enough for casual wear, but much nicer than a regular T-shirt. I decided to make one up for Isabel in polka-dotted rayon knit, taking a bit more time due to setting up the cover stitch machine for the hems and making a facing for the back neck. 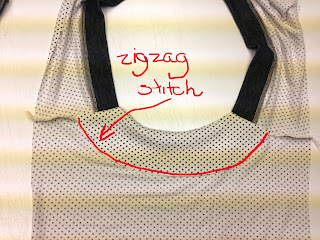 The pattern directions have you finishing the neck by turning and stitching. This is fine for children's tops, in a sturdier knit such as cotton, and you could add some sort of stabilizer under the turn-and-stitch finish. But I learned a great technique for a knit neckline from HotPatterns. 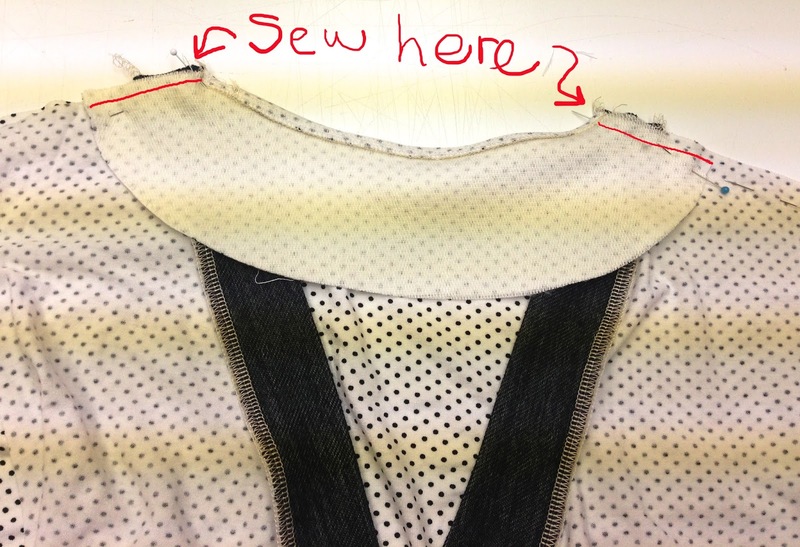 The facing is only on the back neckline but neatly encloses and reinforces part of the shoulder seams. 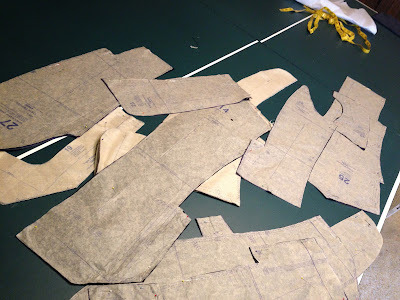 Here are some photos which show the steps to sewing in the facing. (Sorry for the stripes; they show up because of my fluorescent lighting.) I drew a back facing using the back pattern piece as guide, then cut and interfaced the piece. After attaching the facing to the back piece, sew the shoulder seams. Then, turn the facing down over toward the front. After the facing has been applied and turned to the correct side, stitch down the edge with a zigzag stitch to keep it from flipping on you. I dug out this pattern because my 12-year old expresses admiration every time I wear the fuschia and black top I made. So since Jalie patterns include the whole range of sizes from toddler to way past mine, it was time to take advantage of it. 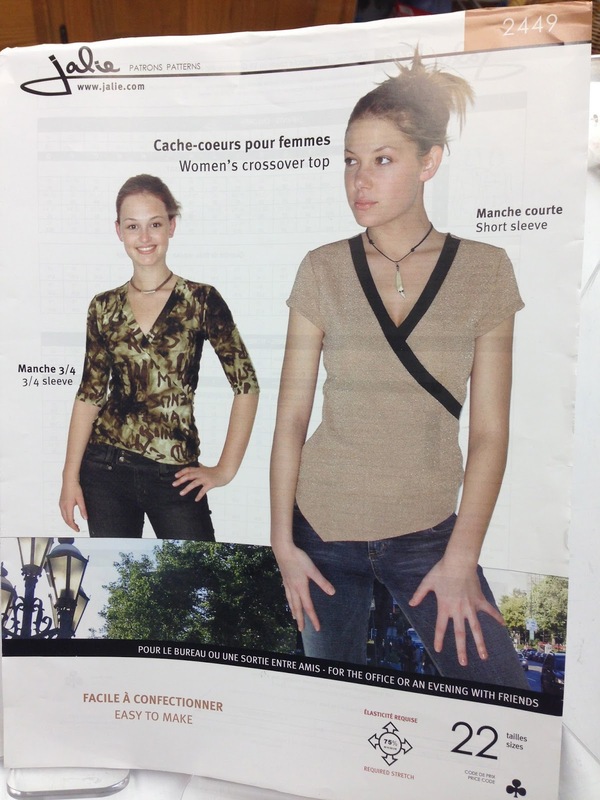 I bought this pattern years ago, and made 2 tops. I liked the tops, but I've also been sewing other very similar wrap tops from other patterns. I've come to the conclusion that the Jalie wrap top is my favorite. For the version with the sea-green band, I made the back hem with a curve, rather than straight. 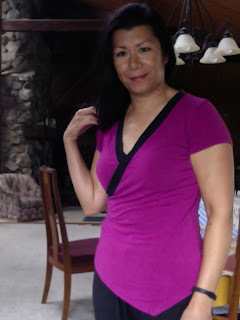 I made this version in autumn colors several years ago, in rayon knit, with non-stretch faux suede bands. 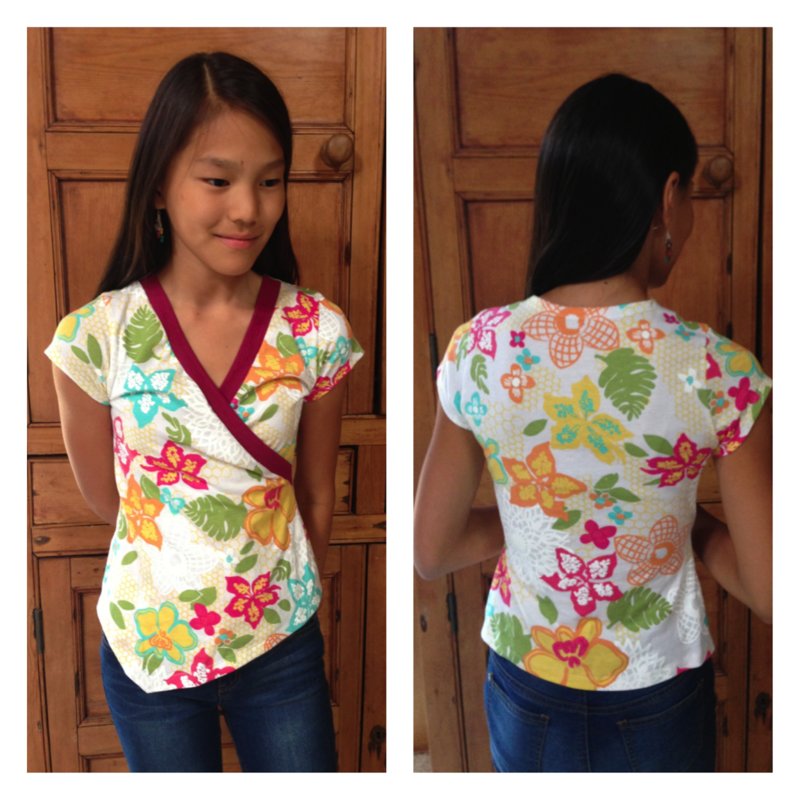 This top is so quick to make! I am averaging about 1 hour per top. 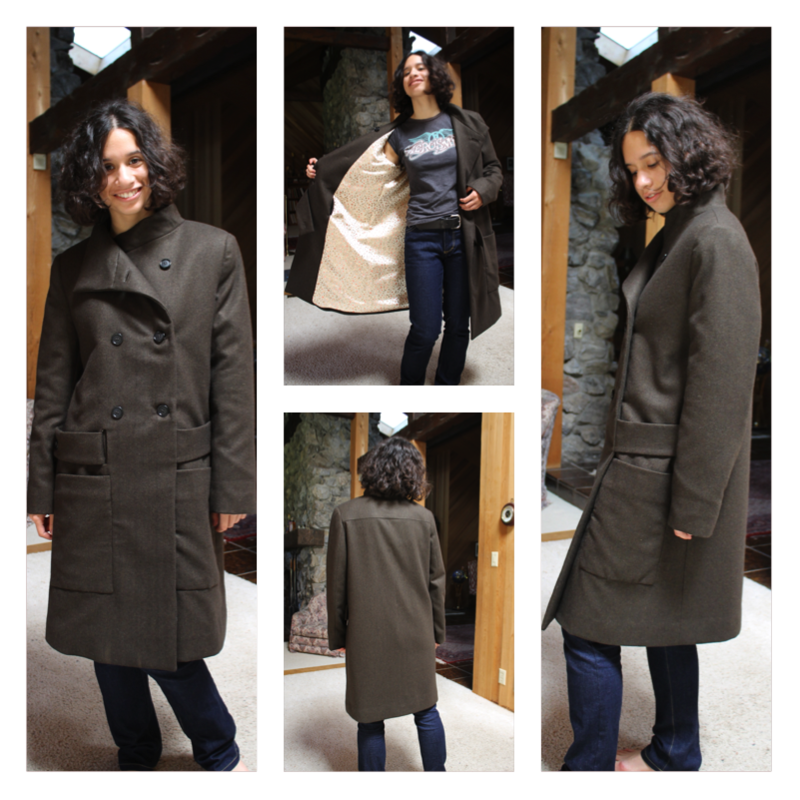 While it is still pretty warm to be trying on a wool coat, Isabel gladly modeled it for me, as she was quite excited to receive a nice coat. There are several things about this design that I really like. The belt detail is a bit unusual and actually doesn't look bad unfastened. 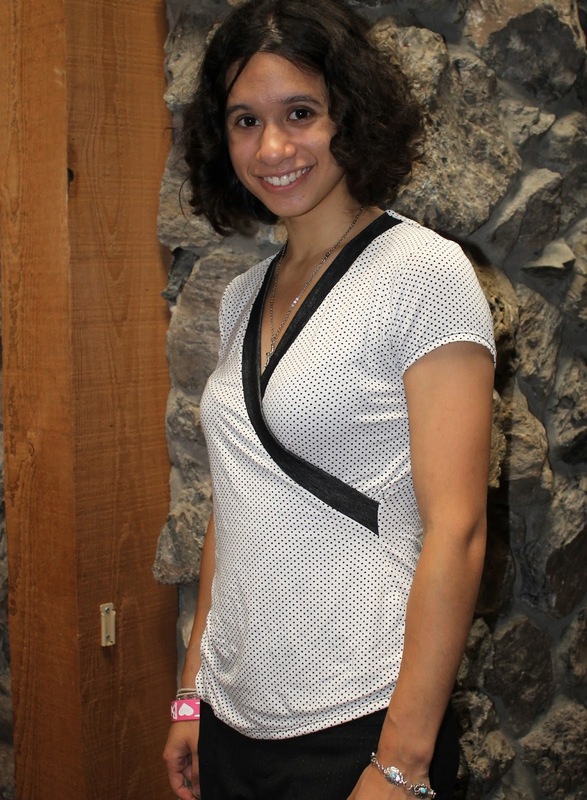 When the belt is unbuttoned, it doesn't hang down too low, and there's no way to lose it. Or instead, it can be left fastened while the rest of the coat is unbuttoned, for a bit of climate control. While the size and shape of the patch pockets can easily be customized, the idea here is that they are nice and deep, so things don't fall out as easily. 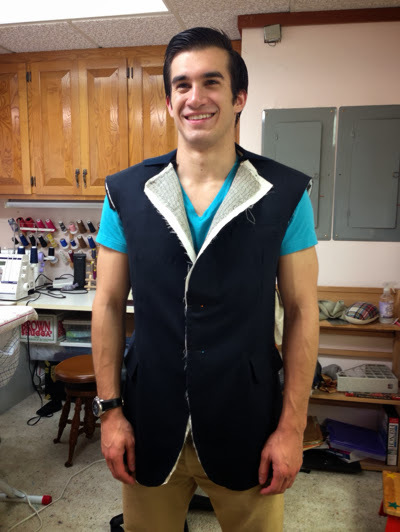 And finally, the oh-so-easy-to-construct collar can be worn up to guard against wind, or folded down, and there was no notch construction to deal with. I wanted this coat to be roomy enough to wear with a sweater, so I made a size 40, with no alterations, and I am quite happy with the fit.